Argus is a plant with DNA nanosensors inside it that detects Lead (Pb2+ Heavy Metal). Irregularities in industrial waste management has lead to depletion of water quality in rivers in many regions. Current processes of monitoring the water quality are not realtime (taking a week or longer) or require special systems that are not off-the-shelf. Through Argus, we propose a novel water monitoring method where plants provide an optical readout of Lead in water. A DNAZyme is used as sensor assay - double stranded DNA that breaks into single stranded on contact with Pb2+ and bind to single walled carbon nanotubes. This sensor assay can be injected inside the leaf of a plant and stays within the intercellular space. 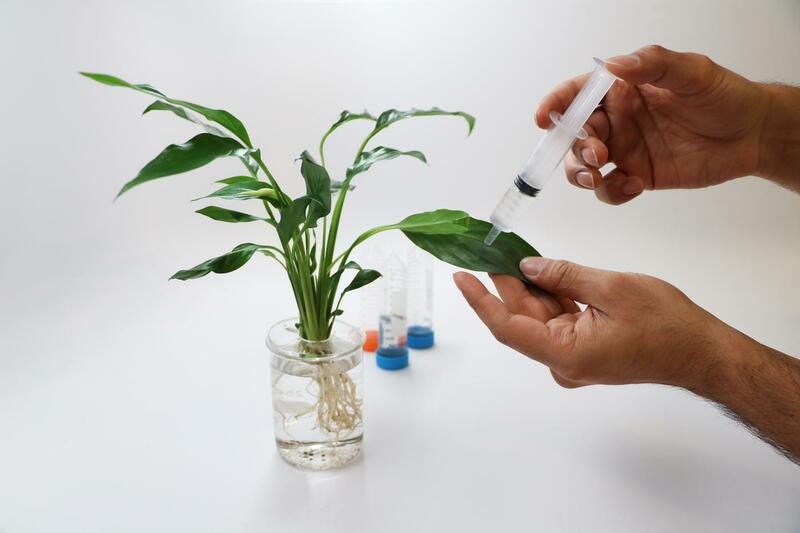 Spathiphyllum plant system, normally used as a houseplant was chosen for testing the sensors to show the applicability in homes and other environments. A needleless syringe was used to do infusion of sensors through the abaxial side of the leaf. We use ‘8-17 DNAzyme’ for turn-off assay where 5'-end of strand is labelled with a quencher and 3'-end with a flourophore, modified for in-vivo detection. In presence of Pb2+, the dsDNA is cleaved to ssDNA which binds more strongly to SWNT walls thus quenching the flourophore. The reduction in fluorescence is proportional to the Lead(II) concentration. Following introduction of Pb2+ ions, the fluorescence output is quenched due to release of ssDNA and its binding with the CNT walls. The following pictures show the time resolved output. 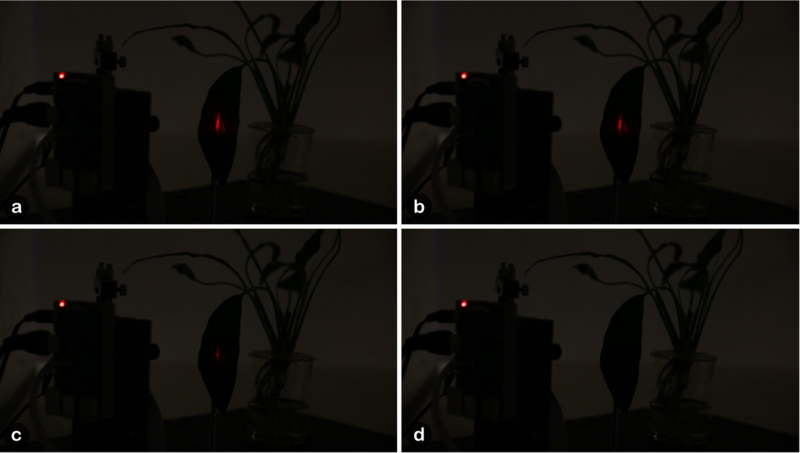 The ‘in-vivo’ rapid detection is interfaced with the digital world, with the vision of a greater detection palette and bidirectional relay channel with the plants.